We are raising a generation of "nice" kids. Nice kids are well behaved and look good on the outside, but they often lack courageous character inside. Offering practical wisdom gleaned from his experience as a parent and family coach, Tim Smith helps you move your kids from simply polite to truly compassionate. He targets nine key qualities children need but often lack and shows you how to build them into your children by modeling core values and biblical practices. Your kids can be--and indeed, are meant to be--kingdom builders who help bring God's light and life to others through their decisions and influence. "Being nice won't help them stand apart," Tim says. "We need to strategically train our children to engage and challenge the popular views of our culture." Here is a clear, down-to-earth resource that will help you do just that. But be prepared for change--in you, in your kids and in the world. "Tim Smith said it so well: 'Strong parents produce strong kids. Weak parents produce weak kids.' In the pages of this book, Tim will guide and encourage you to be 'strong parents.' Step up to the plate and the enjoy the responsibility and the privilege of being a parent." "If you're looking for a parenting resource that will make you feel all warm and fuzzy, put this book down. But if you truly want your kids to grow up with the kind of godly character that will help them be people of integrity and strength, then start reading. Tim's words will challenge you and make you rethink your assumptions about what it means to be a parent. This book will not only change your ideas, it will change your family." "While reading this book, I was reminded of Jesus' question: 'What good will it be to gain the whole world and yet forfeit our souls?' As parents, it is so tempting to focus on our children's academic achievements, athletic awards, good looks and future career success. In the process, we often neglect opportunities to influence and shape their Christian character. Tim Smith challenges us to move beyond raising nice, wimpy children. We cannot afford to just give our children what they want or what we want them to have. Instead, to live as Christians our children are going to need traits such as courage, discernment, compassion, empathy and contentment. This book provides parents with practical steps to help our children develop these important qualities." "Tim Smith hits the nail on the head! The apostle Paul said that we're to raise our children 'in the training and instruction of the Lord.' That's raising disciples, not just nice kids! Sound tough? This book maps it out and makes it easy!" "Tim Smith is one of America's finest and most refreshing parenting experts. This book will show you how to raise your kids to be responsible adults. It is a fresh approach and very practical." "Tim Smith shows parents why pulling the weeds of bad behavior isn't enough. We must also nurture the roots of a good heart. This book is filled with practical ways to fill our homes with grace and love, so our children will be able to face the world they live in." "A fantastic book for parenting the next generation. Great insights. The best I've read!" "There's a reason someone made up the saying 'Nice guys finish last.' The last thing you want to have happen is to raise kids that are easily influenced, intimidated, defenseless. . . . I invite you to pick up the cadence with one of America's great family coaches and learn better ways to raise kids who are ready for tomorrow. Nice kids? No. Strong, emotionally fit and morally good? Absolutely. 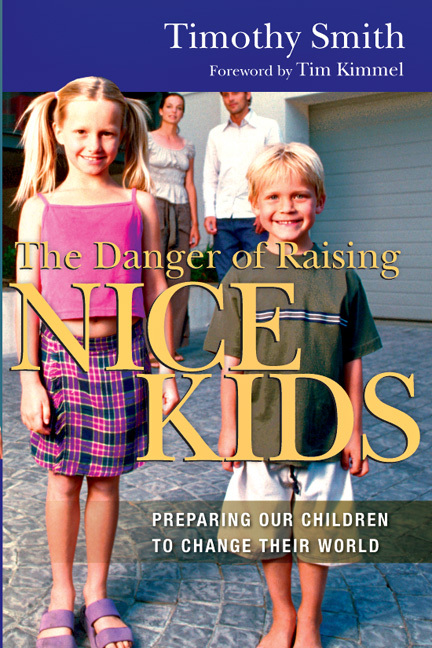 You're going to enjoy The Danger of Raising Nice Kids." A helpful resources that dares to take an approach somewhat out of the mainstream. The strength of Smith?s book is found in its ability to shift one?s parental focus and values. Time Smith helps the reader move from the mindset of protecting or controlling one?s children to the mindset of preparing them for maturity and responsibility. Timothy Smith has worked with children, youth, and families since the seventies. In 2003 he cofounded Life Skills for American Families, a non-profit organization dedicated to innovatively celebrating and empowering the family. He also leads a team of community leaders to produce "40 Days for the Family," an innovative family-building initiative. Smith is a Research Fellow with the George H. Gallup International Institute of Princeton and presents seminars to parents, youthworkers, and youth based on his research and books. He has written fifteen books including The Seven Cries of Today's Teens, The Relaxed Parent, and Connecting with Your Kids. He is also one of the authors of Help! There's a Teenager in My House. He is currently presenting his seminars to parents and youth workers throughout North America.